Susan Hohweisner was selected as the Faculty Focus Friday employee for high schools! 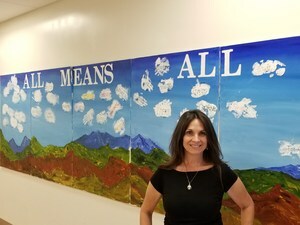 Susan is a teacher within the special education program at Hemet High School. She constantly goes above and beyond to ensure that her students have a multi-faceted educational opportunity. Each year she coordinates a Talent Show to provide our special education students the opportunity to perform and demonstrate their special talent! Susan has also taken on the coordination of an art show where each student displays art projects completed throughout the year - we have some amazingly gifted artists which have blossomed with her support. She mentors new teachers, lends guidance to experienced teachers, and is always a listening and comforting ear for parents. Thank you Susan for all of your hard work, Hemet High and our District is very fortunate to have you!